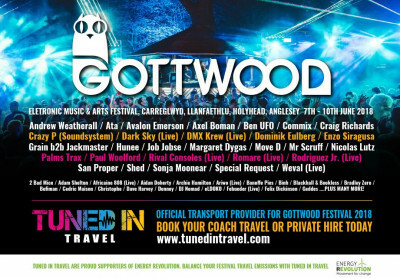 Tuned in Travel are excited and proud to announce being the exclusive travel partners for yet another fantastic festival: Gottwood. This independent Electronic Music & Arts festival is hosted on the beautiful island of Anglesey, around an enchanting lake and mansion. The fairy tale like setting has secured Gottwood as one of the most picturesque festivals in the UK and the perks don’t stop there. Unlike many before it, Gottwood has stuck to its promise of keeping the event cosy, with a crowd of only 5,000 permitted each year. The scenery and small scale keeps this open air event a chilled out festival with a friendly vibe and promise of great time. Unsurprisingly, Gottwood was nominated for best dance event in the UK with its ten stages hosting huge performers with blow away sets. Those bringing the party together this year are DJ and Producer Andrew Weatherall, the Swedish house music DJ Alex Boman, tech master Craig Richards, and electronic music group Crazy P, just to name a few. There are loads more acts lined up ready to have you dancing the four days away beneath the trees. All the dancing is sure to get you hungry at some point thus Gottwood have an array of amazing food outlets available, with food from all over the UK including local specialities – yum! When you’re ready to take a snooze the festival have a various camping options available including several forms of glamping to fit different budgets. Here at Tuned in Travel we want your party at Gottwood to be nothing short of amazing which is why we are helping to take you and your group to and from the festival, stress free. We are providing weekend return coach options from major cities throughout the UK meaning you and your group can sit back knowing the hard work is done for you. For those catching the train, we are providing a shuttle service from Holyhead Railway Station straight to the festival, saving you money and time – a winning duo. If you’re travelling in a larger group of twelve to fifty people and are seeking something more exclusive we have private hire vehicles available in standard, executive and luxury options. With door to door pick-ups at competitive rates, why not book today with our super easy booking process? If you can’t find a trip that suits your group or if you have any accessibility requirements, simply contact our customer service team at customerservice@tunedintravel.com for a free quotation. We want to ensure your journey runs as smoothly as possible while doing our best to minimise the unavoidable carbon footprint created by audience travel. We have teamed up with UK charity, Energy Revolution to balance fossil fuel travel miles, giving customers a chance to offset the pollutants generated during their travel with an investment into clean, renewable energy. 100% of donations made when you purchase your travel ticket will go to towards creating clean energy. Book and donate today!